It is a FOXEN tradition for Billy to prepare or provide lunch for our staff every Friday. Usually his lunches are simple, seasonal fare—such as locally made tamales, homemade soup or special sandwiches. 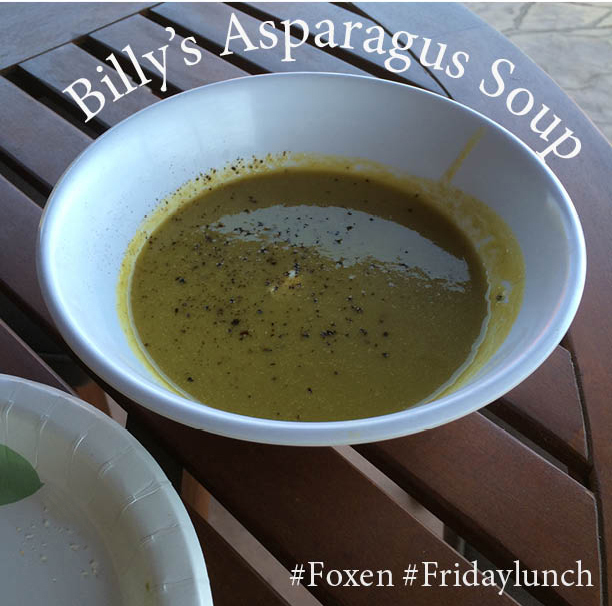 Our staff looks forward to #foxen #fridaylunch, as Billy is always coming up with new and exciting recipes each week. Last Friday, to celebrate the spring asparagus picked that morning from his garden, Billy made a special asparagus soup to the delight of our entire staff. It has been suggested by some of our fans that we should share some of these recipes with you all. With that in mind, we thought we’d share Billy’s asparagus soup recipe here, which was adapted and inspired by a recipe posted by Once Upon A Chef. 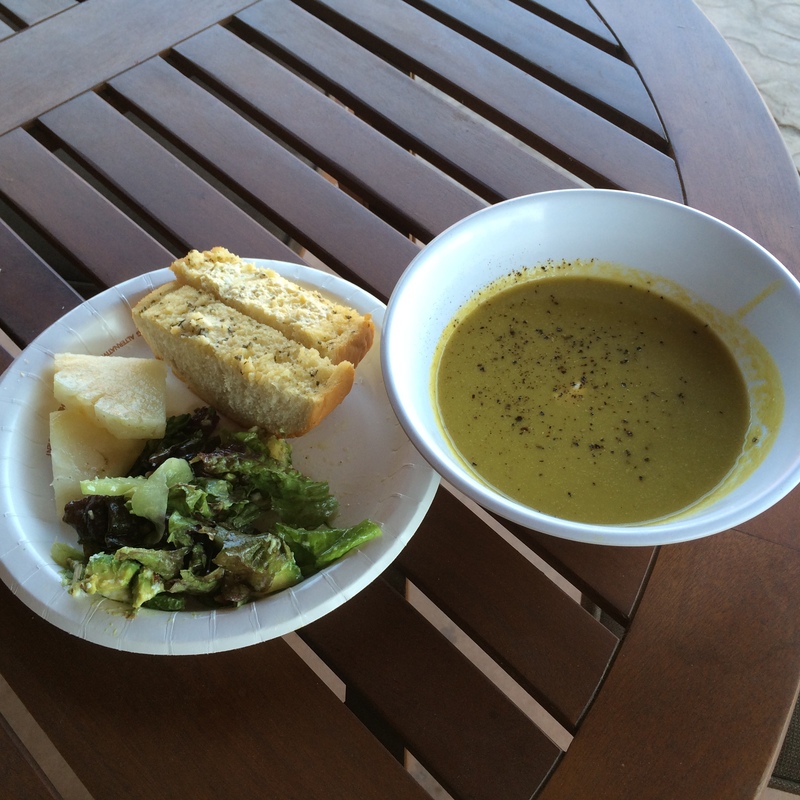 We found that this delicious soup paired perfectly with our Estate Dry-Farmed 2012 Tinaquaic Vineyard Chardonnay. You can purchase our Tinaquaic Chardonnay in our tasting room or click here to purchase online. * You can also substitute the shrimp for garlic croutons if you would prefer. Melt the 2 Tablespoons of butter in a large pot over medium heat. Add prepared shrimp with a dash of salt and pepper and cook till done. Set aside. Melt 3 Tablespoons of butter over medium heat and add the onions and garlic and cook until soft and translucent, about 10 minutes. Cut the asparagus spears into 1/2-inch pieces. Add the chopped asparagus to the pot, along with the chicken broth, 1 teaspoon salt and 1/4 teaspoon pepper. Bring to a boil, then cover and turn heat down to low. Simmer for about 30 minutes until vegetables are very tender. Purée the soup with an immersion blender until completely smooth. (Alternatively, use a standard blender to purée the soup in batches, then return the soup to the pot.) If necessary, pass the soup through a fine sieve to remove the fibers (the best way is to place the sieve over a large bowl, then use a ladle to push the soup through in circular motions). Return the soup to the pot and bring back to a simmer. Stir in the lemon juice and Parmesan. Taste and adjust seasoning with salt, pepper and more lemon juice if desired (you may need up to a teaspoon more salt). Ladle into bowls and pour yourself a glass of 2012 Tinaquaic Chardonnay and enjoy!